The Mower Shop of Fort Smith, Arkansas, had its beginnings in 1986. Our original product lines, Toro® and Stihl®, were the cornerstones of the business. As commercial product demands escalated in the 1990s, so did our product lines. In 1990, Grasshopper®, being one of the original Zero-Turn mowers in America, was the Mower Shop's first choice to serve the growing market of commercial users and homeowners wanting to save time and increase productivity. With the advent of online shopping, we launched our website in 1999. Today, the Mower Shop's internet store is a number 1 hit with Grasshopper® customers seeking fast, reliable service providing parts shipped directly to their door. As we've grown and times have changed, The Mower Shop's mission has remained the same: Offering the best service, parts inventory, and professional sales for Grasshopper®, Honda®, and Stihl® outdoor power equipment. A growing number of loyal Fort Smith shoppers have continued to support The Mower Shop throughout the years, including enthusiastic support for our charitable community outreach projects. 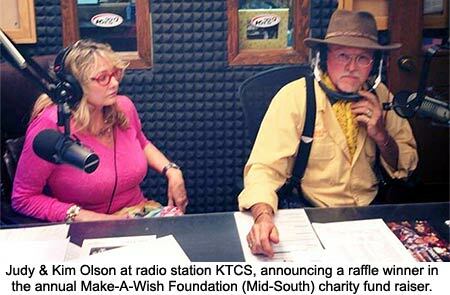 In 2004, we partnered with Radio KTCS 99.9, jointly participating in the annual Make-A-Wish Mid South's Spring Fund Raiser to grant wishes for area children with life-threatening diseases. Each year, Grasshopper® Mower and The Mower Shop donate a new Grasshopper® mower to be raffled. Raffle tickets are sold one per each $1.00 donation; with each ticket you receive a chance to win the mower. The Grand Prize drawing is held as part of a Radiothon, during the first week of April. 100% of the money raised goes to the Make-A-Wish Foundation Mid South. As the costs of fulfilling the children's wishes continue to go up and more children await a wish, fund raising has become a much larger community effort. With that in mind, live concerts featuring Grand Ole Opry star Emi Sunshine and the Rain, and sponsorship of local Dirt Track Auto Races became a part of our fund raising traditions. It's just our way of giving back to a community that has supported us for 30 years and generously allows us to be part of a wonderful organization like Make-A-Wish. If you are interested in donating to Make-A-Wish, we accept donations year-round— every dollar of which goes straight in to our Mid South region. Thank you for allowing us to serve you, whether you are local or a nationwide customer, and we hope to always exceed your expectations. The Mower Shop sells OEM* Grasshopper® Mower parts. Why are OEM parts better? You made a substantial investment in high-quality machinery when you purchased a Grasshopper® mower, deck, and attachments. When you invest in quality Grasshopper® equipment, don't be tempted to save a few dollars on generic aftermarket parts that can reduce your mower's power or efficiency. Protect your investment and ensure peak performance by trusting only genuine Grasshopper® parts and supplies to maintain your mower. After-market parts have proven time and time again to be unacceptable, and have even voided warranty in some situations. Manufactured to meet ultra-precise engineering specifications, genuine Grasshopper® parts help you maximize performance and significantly extend the life of your mower. The Mower Shop, Inc. is an authorized Grasshopper® Dealer and OEM Grasshopper® Parts House. The Mower Shop offers competitive pricing, so why settle for after-market parts when you can go with genuine OEM parts? The Mower Shop keeps on hand and ready to ship, more Grasshopper® replacement parts than many shops sell in a lifetime. We often fill as much as 98% of our orders from stock on hand, and if we receive an order for something we don't have in stock, we'll order it right away. The photos below represent only a portion of our substantial inventory. We're ready and able to ship the part(s) you need to keep your Grasshopper® machine running in top condition. 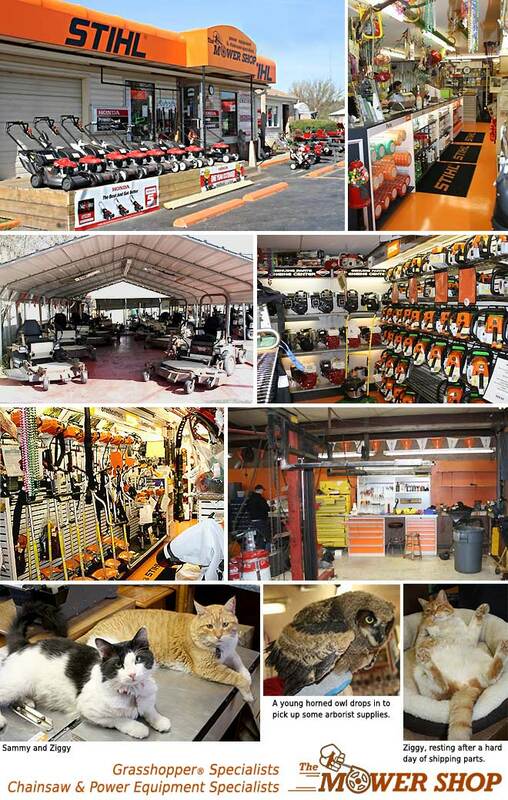 Click here to read what people are saying about their Mower Shop experience.